Here is a bit of history. As a Swedish fleelancer, it was easy for me to sell stuff to foreign markets once the Scandinavian scene got going. It started with Metal Hammer in Europe and then it moved Stateside and Creem Metal picked up stuff for a while. I had interviewed all these bands and followed some of them on the road etc, so it was good fun to promote these guys abroad. I was also very aware that I had the opportunity to perhaps name a scene, especially when I delivered the early stuff to America, so I kept dropping the line “First Wave of Scandinavian Metal” into my articles. Don´t know if it stuck (got to ask Martin Popoff about that), but I gave it a shot. The biggest article I had was a five page story on Europe in Creem Metal (July 1987, bottom right), a follow up to an earlier story that had featured Europe, Treat and 220 Volt (top left). I retired myself from this scene around 1990, it was a case of “been there, done that”, and the scene was changing as well. I was well positioned to be one of the prime movers in our media when Deep Purple reunited back in 1984. Not only had I interviewed Jon Lord just a couple of weeks before the reunion (he had hinted at it, you can find the interview on this blog), but everybody understood that I knew what I was talking about as an ex fan club editor (this was in between clubs). Photographer Michael Johansson and myself had a field day, it was a lot of fun. Johansson had the shots in three of these articles. I don´t have these available to me right now but if memory serves me right these are articles from Recension and Poppis (1984 and 1985). 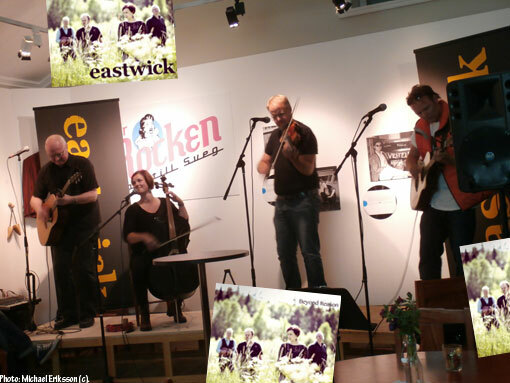 September 14 meant election day here in Sweden and my friend Jens Ganman mentioned that his band Eastwick was going to play at Jamtli Museum here in Östersund (Jämtland County) tonight, so I popped in and took a few snapshots. I was there for a few minutes but I felt I had to add something from the day in the old archives. I mentioned OKEJ earlier this week in the post about creator Hans Hatwig. I did have a few articles published in this magazine back in the day and the biggest I had was this one – a nice spread with Lucy Lawless in issue 9 2000. My friend Anders Tengner was the editor at the time. I recall not asking for money, but for a box of copies instead. I had the LUCY IN THE SKY publication going at the time, and knew that I could sell and trade copies of this. I still have copies but they are boxed up in the basement at the moment. I found a bunch of scans of old articles from a long gone site of mine, so I will show you more stuff from the good old days here on this blog later on. The new Deep Purple release “Graz 1975” arrived in both LP and CD format in the mail today. Friends of this blog will know that I used to run a couple of Deep Purple clubs here in Sweden back in the day (1978-1983 and 1991-2003) and so my interest in this goes Deep. I also have a rather nice collection so I have been helping out with scanning archive material for Deep Purple Overseas for them to use in their business ventures and this time around I can see that they have used a few of the scans for this release. Pictured above is a promo shot distributed by EMI Sweden back in 1975 that was certainly used. 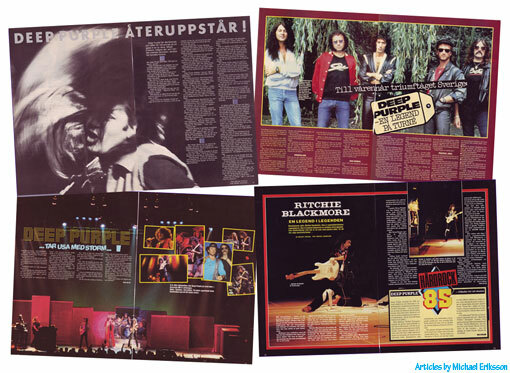 It shows the band on their visit to Sweden on this tour getting Gold Awards for “Burn” and “Stormbringer”. The guy you don´t recognise is Ture Sölsnaes from EMI. Nice to be able to help out a little.